Hello everyone!! It's Lindsay from the DT here with you today, sharing a shaker with a twist. 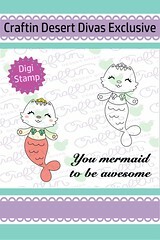 Whenever I first seen the "You Mermaid" digital stamp, I knew I wanted to use it to create a little scene, complete with waves and even little fish underwater. So, I needed to create a half shaker and figure out how to hide adhesive in the middle of my card, behind the vellum. You can watch the video tutorial below to see all the details on how I put this open ended shaker card together!! After printing off the digital image and the sentiment onto white card stock with my laser printer, I used the Fancy Frame Dies (the largest scalloped rectangle) to die cut a panel. 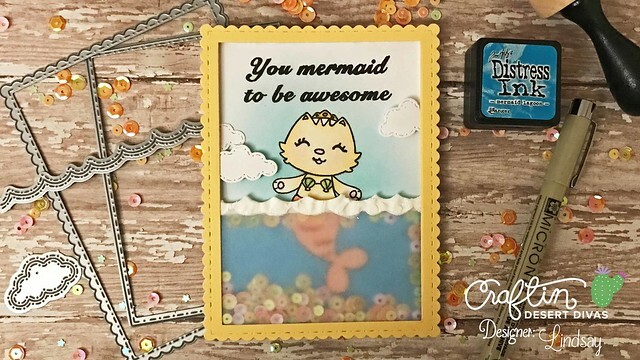 I also used the same scalloped rectangle die to cut a piece of vellum and then did a bit of die cut inlay with the same die and the smaller stitched rectangle to create a peach frame. Finally, to finish up my die cutting, I die cut the vellum panel about 1/3 of the way up from the bottom with a wave border die from the Outdoor Landscape 2 Dies and also used the same border die to create a "stencil" from the leftover vellum. I used this stencil to create a nice border on the top of the vellum panel, so I could apply a thick layer of whipped spackle. This layer of spackle allows a place for me to hide adhesive and also gives nice texture and interest to the scene! While I waited for the spackle to dry on the vellum, I brought out my alcohol marker to color in my mermaid image. I did use my laser printer to print off the images, so after coloring and my hands rubbing over the images, the lines weren't as dark as I wanted them, so I used my Micron pen to darken all the lines as well as the sentiment. This little trick also helps hide any tiny mistakes from coloring! To finish off my scene, I masked off the mermaid, using a fussy cut image and rubber cement, and applied two different Distress Ink colors to create a sky and ocean. I used a heavy hand with Mermaid Lagoon for the ocean color and Salty Ocean with a very light hand for a soft sky around the top of my mermaid. Be sure to watch the video tutorial to get a few tips and tricks on how I put together this open ended shaker. 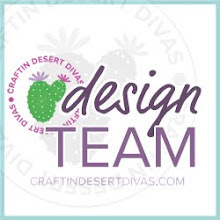 I did use the Craftin Desert Divas Melon Drop Sequin Mix for the shaker portion and I used this sequin mix to choose colors for my entire card. 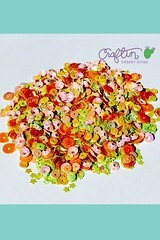 If you have trouble with color combinations, like I do, I often look to a sequin mix or patterned paper that I might be using on the card and match colors from those! When I was through putting the shaker together I added a few stitched cloud die cuts from the Scene Builders die set and put a layer on Wink of Stella on each one for some shine. 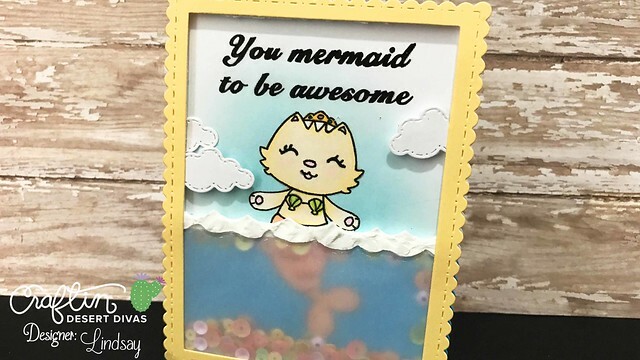 Finally, I adhered the entire panel on a card base that I made by die cutting an A2 card base with the largest scalloped rectangle die that I used throughout the entire card. This allows the entire shaker panel to fill up the card base and be the actual card with no layers around it! 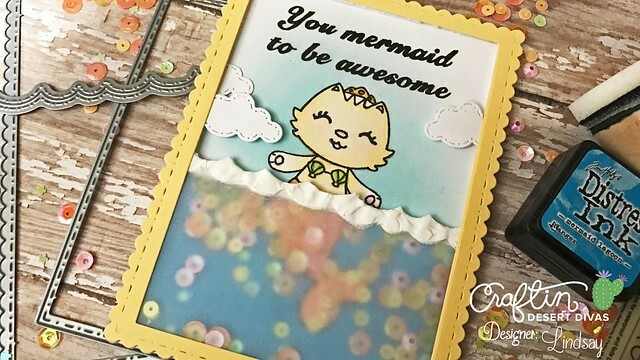 This was such a fun card to make and a bit of a challenge to figure out all the layers, which made it even more fun to put together! I hope I gave you a few tips and trick on how to pull together an open ended shaker and also how to hide your adhesive for cards like this! 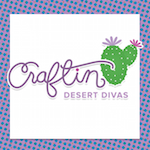 If you are interested in any of the Craftin Desert Divas supplies I used on this card, you can find them all linked below!! Thanks for stopping by and spending some time with us today!! Until next time, Happy Crafting! !